The Coral Cottage master bedroom--I gave you a sneak peek in this post. Now let me show you what we have done...Remember the "Before" photos? Finally the cement floors were covered with Allure vinyl plank flooring in Oak from Home Depot. And we have a nice new ceiling fan from Home Depot as well. 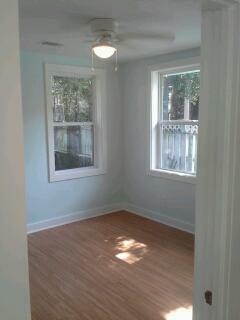 All ready for furniture! Coming up! Love that blue with the white trim. Is there a reason you didn't just paint the cement walls? Yes, Julie...The whole house needed rewiring and there would have been lots of wires to cover coming down the walls. 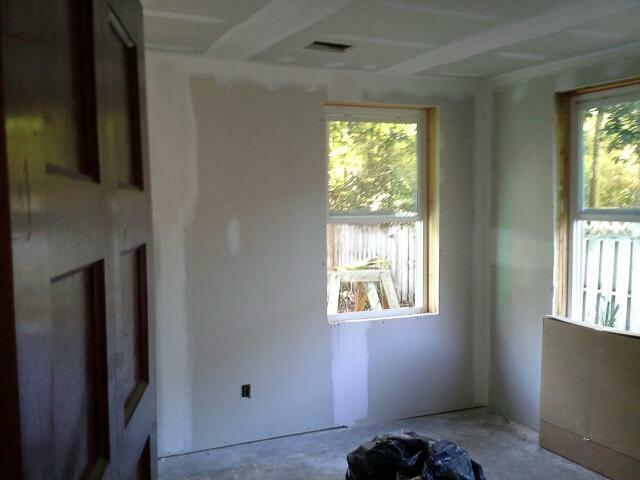 I didn't want to see that so we put up the wood strips and sheetrock to hide it. left you info on blog book in previous post's comments. you know I'm gonna have to come stay at your coral cottage. I'm loving it so much! Thanks--I will check that post out. I hope you will plan a visit to The Coral Cottage--we'd be honored to have you! oh....and I saw the comforter over on jane's blog! Nice isn't it? Blogging about it and the rest of the room Friday--hope you'll check back! Thanks so much for reading and for your encouraging comments Janet!